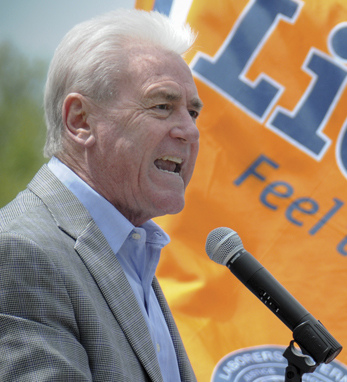 Terry O’Sullivan became the tenth General President of the Laborers’ International Union of North America (LIUNA) on January 1, 2000, and is dedicated to growing his union’s membership and market share. O’Sullivan’s mantra is “organize or die.” Under his leadership, the union also has significantly expanded its efforts in, and commitment to, member activism, capital strategies, grassroots politics, labor-management cooperation, journeyworker upgrade training, apprenticeship, and leadership education. Recognizing that labor and management share many of the same concerns and interests, he has built alliances with a wide range of owners, contractors, and business groups. A long-time, vocal supporter of Sinn Féin and its work to secure a peaceful, just, and united Ireland, Terry O’Sullivan serves as President of New York Friends of Ireland and Chairman of DC Friends of Ireland. A proud native of San Francisco, California, he joined LIUNA in 1974, and is a long-time member of LIUNA Local Union 1353 in Charleston, West Virginia. Click here to read O’Sullivan’s April / May 2017 Hall of Fame profile.